Options Small 6" Medium 8" Large 10"
Got yourself a tough, little chewer? The TireBiter is the perfect dental chew device for your dog's teeth. The combination of soft natural rubber, nylon fibers and cotton rope removes plaque and tartar build up. 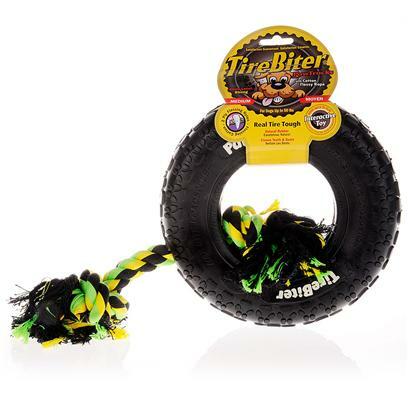 Great for puppies who are teething and will withstand the heavy chewing of large dogs. Supervised use recommended. Replace, if damaged; nylon fibers can be a choking hazard if swallowed.